DMV Test On the Go, Mobile/Tablet version is Available Now! Learn From Mistakes and Never Answer Them Wrongly Next Time For Your DMV Practice Test! Practice Driving Test For FREE !!! Or Practice with Randomly Generated Sample DMV Questions. Select Number of DMV Questions You Wish to Practice with, and Click the"Practice Driving Test" Button Below. - Regulatory, Warning and Informational Road Signs in the United States. - Find out vehicle registration, driver license, dmv office address, application forms, driver's manuals, handbooks, DMV publications from the official DMV agencies. California DMV Written Test for IPhone/IPad Download our App and practice the permit test on your mobile phone. The main purpose of DMV practice driving test is to assess a person`s knowledge of driving in theory. It is to check learner drivers awareness of those traffic signs, road marks signals, other road users and possible hazardous situations on the road, so that they can drive safely and responsibly on the road. The format of practice driving test varies from state to state. The number of questions, time allowed, and minimum passing score are different from each USA state. In New York state, 20 multiple choice questions are asked, learners need to answer at least 14 questions correctly in order to pass the written driving theory test. In California state, 36 DMV questions will be asked, 6 or fewer errors will lead to a pass. In Pennsylvania, the learners permit test consists of 18 multiple choice questions, you will need to correctly answer at least 15 questions in order to pass. Solid knowledge of following topics are expected to pass your leaner practice permit test (DMV written Test, or in other words named driving theory test) for getting your drivers license in the United States of America. In order to get your driving license, you are required to pass one learner permit dmv written knowledge exam (theory on paper) and one real road driving test, normally you will also be required to take a vision or health examination to ensure that you are fit to drive (not to put yourself or other road users in danger). Most states have adapted the graduated driver licence program (GPL). Different license is issued to you at different stage when you made progress along your journey of learning. - You will known the right answer immediately when you practice with our interactive dmv written test engine. - Further info or related comments are easily available, most of the time you can tell what is the trick and what is deemed as important in the actual dmv written theory test. - Signing up an account is optional, you are not required to fill up forms or register if you are not willing to, you are just one click away from the learning process, easy and go. - Our Free DMV test questions are set based on the official drivers manuals, you can always be sure what will come out in the actual dmv written test at your local dmv office. 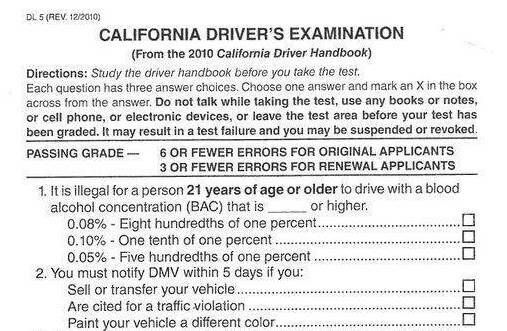 Following is a screen shot of the California Driver's Examination, that's how an actual DMV examination paper and questions look like, some states do not have a computerized driving test, you will need to answer questions with an actual pen or pencil. The most official DMV test study guide is the driver's manual (some states name it as driver's handbook ), all information needed in the driving test, could be found in the manual, so reading the manual carefully, take notes when necessary, ensure you have mastered the rules and regulations, signs and road marks, it will be pretty straight forward to pass the drivers' liccense test once you are fully prepared.